One item currently confounding curators is <a href="http://www.chapala.com/chapala/jaina%20figurines/jainafigurines.html">this Mayan figurine from Jaina Island in Mexico</a>. It was hoped that its legitimacy could be determined through the presence of a special blue pigment found in the piece, but it turns out modern ceramics makers still use that hue. A case is being made for thermoluminescence testing, which costs up to $1,200. Unlike similar pieces the ROM holds, this Zapotec ceremonial urn (circa 200-500 A.D.) is legit. Fake versions sometimes include symbols that were attached to the chest during the early 20th century, and details borrowed from other regional cultures. Senior conservator Susan Stock at work on a Shang dynasty zun in the metals lab. This bronze zun vessel from the Shang dynasty (circa 11-12th century B.C.) was accidentally shattered soon after it was acquired by the ROM. Preservation work has revealed that past conservators attempted to fix the piece by adding filling material that didn’t match its original composition. Conservators are not sure if the two main pieces actually belong together. Tools of the metal conservation trade used in the ROM’s conservation labs. Which of these Cypriot terracotta figurines of a woman holding an infant is real, and which is fake? Answer: the one on the left is legit. The fake shows signs of artificial weathering and lacks fine detailing. One tell-tale sign: the design on the real item continues on the reverse. We also checked out the x-ray lab, where the equipment includes a digital radiography machine which has cut done processing time from hours to minutes. Old-fashioned warning signs remain. Everyone makes mistakes, including our major cultural institutions. The antiquities world is riddled with fakes, so it’s not surprising a few have slipped into the Royal Ontario Museum’s collection over the past century. 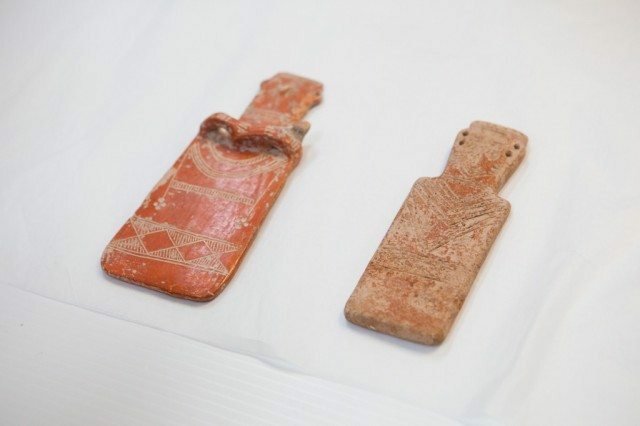 Technological advances in the identification of an object’s true age have revealed that items originally believed to be ancient relics are in fact the equivalent of fake Coach bags. The ways the ROM goes about identifying the impostors lurking in its vaults (some of which were displayed during the ROM’s 2010 “Fakes & Forgeries: Yesterday and Today” exhibition) are the basis for the first episode of Museum Diaries. Debuting on TVOntario on February—just in time for the institution’s centennial in March—the six-part series takes a behind-the-scenes look at the ROM, covering topics from field research to the preparation of children’s programming. During the museum’s early days, researchers were somewhat less concerned about authenticity—acquiring pieces that looked right was the critical issue as museums competed to build their collections. Testing factors such as an item’s thermoluminescence has shown that, for example, several Zapotec ceremonial urns purchased in Mexico by the ROM’s founding director Charles Currelly were clever contemporary pastiches of genuine relics and manufactured embellishments. Ironically, the passage of time has turned these century-old knockoffs into legitimate artifacts that represent the work and skills of those who produced them. While care was taken with the creation of the Zapotec forgeries, other fakes held by the ROM are impressive for their shoddiness. When the supply of legitimate Greek Tanagra figurines ran low during the 19th century, imitations with poor detailing and disproportionate anatomy filled the void. Other items in the collection display fake aging techniques that make them appear more worn than the legitimate artifacts. Museum Diaries premieres February 25 at 7:30 p.m. on TVO.